Villa Olympia is a lovely modern four bedroom villa which can sleep up to 10 people. It is located in the Del Duque area of Costa Adeje in Tenerife and is only a 3 minute walk from Playa del Duque beach. 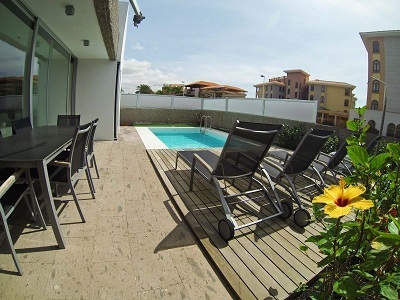 It is in an ideal location, being very close to the desirable shopping centre of Plaza del Duque and is surrounded by 5 star hotels such as Bahia del Duque, Gran Tacande and Anthelia. The villa has been fitted with full air conditioning and also enjoys wifi internet access. The villa has marble floors throughout apart from Bedroom 1 which has wooden parquet flooring. Outside there is a private pool and a decked sun terrace furnished with several sun loungers as well as a patio table and chairs for alfresco dining. There are also several garden areas with artificial grass. A garage for 2 cars is available for guests to use.